Headaches can be anything from slightly annoying aches that just won’t go away to serious pains that disrupt your daily activities. When a headache strikes, most people immediately reach for some kind of medication to make it go away. But there are more natural remedies that have been in use for thousands of years, called pressure points for headaches. Hitting the right ones can make your headache lessen, or make it disappear altogether. These pressure points can help you find relief from headache. Each pressure point should be pressed with two fingers, usually your index and middle finger held together. You can press either with the tips of your fingers or with the flat underside. For some of these pressure points, your thumb might work even better as a great way to apply the necessary pressure to make them work. Touch the depression at the back of your head, the bottom of your skull. Run your fingers from the back of your neck upward, until you pass the first large muscle. There should be a tender point there when you press inward and up. Massage that point by moving your fingers in a circular motion. This has also been shown to help alleviate dizziness and blurred vision, as well as other eye problems. 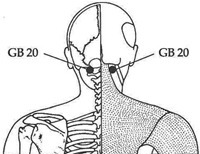 This is at the base of the neck, where your shoulders meet your neck muscles. It is at the highest point on the shoulders. Find the place where it is most tender, then apply gentle pressure for about one minute. The position might be a bit uncomfortable, but should not be painful. These pressure points for headaches can also be used to alleviate swollen lymph nodes and neck pain. It might also help with dizziness and asthma or cough. Press down in the area between your thumb and forefinger in a circular motion and you will feel the bones there, on either side of your fingers. The firmer the pressure, the better, so press down as hard as you can stand. It also helps reduce toothaches. Do not use this pressure point when you are pregnant, as it can have adverse indications for the unborn child. This pressure point is on your foot, located between the big toe and the first toe on the top of the foot. It is between the two bones that make up each toe. There is a small depression there; press into it and massage in a circular motion. Press straight down, as if you were trying to touch the floor through the top of your foot. If you’re pregnant, this one can be a great way to relieve nausea and vomiting during those early months. 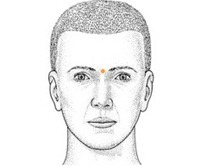 This area is in the mid-point of your forehead, right between your eyebrows. Some people can feel a slight depression there, while others feel a slight bump. Press hard on that spot with your fingers. The pressure is hard enough to be a little uncomfortable, but not hard enough to hurt. Massage the area for at least one minute, taking deep breaths as you do. This also helps relieve from insomnia, anxiety or stress and alleviate sinus symptoms such as congestion and sinusitis. 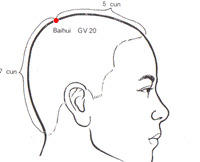 This pressure point is right on the top of your head. You can find it by making an imaginary line from one ear to another. Then, make an imaginary line from your nose to the back of your neck. Where those two points meet is the center of your head. Press down on that pressure point for at least one minute, breathing deeply all the while. 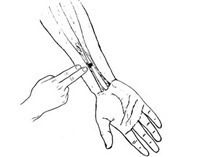 This point is right above your wrist on the inside of your arm. Hold your hand out in front of you and measure about three finger-widths up from the crease of your wrist. (This should be roughly two inches.) The point is directly between the two bones of your arm. Press down until you feel a little discomfort, then massage the area gently with your fingers for at least 15 to 30 seconds. Repeat on the other side for maximum results. This spot on your leg is right above the bone that sticks out in your ankle. Sit down comfortably and find that ankle bone. Then actual pressure point is about four finger-widths up from there, or about three inches away – the point is on the back of your tibia bone. Press against it, moving in the same direction as your toes are pointing. Not only does this spot help relieve headaches, it is also known for making you less irritable. If you are having persistent headaches that don’t respond to acupressure or medications, it might be time to visit the doctor. Though most headaches aren’t serious, it is always better to be safe than sorry, and seek medical advice. Here is a video guide to pressure points for headaches that can help relieve pain.